Of Wiarton, peacefully at Mapleview Long Term Care in Owen Sound, on Saturday, August 24, 2013. The former Lois Gwendolyn Mallard at the age of 83 years. Loving mother of David (Carol), Don (Joan), and Randy (Janice), all of Wiarton. Devoted grandmother of 7; and great-grandmother of 17. Sister of Sharon. Predeceased by her parents Captain Lewis and Dorothy Mallard; and sister Elaine Hatt. 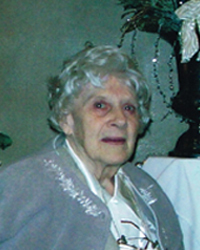 At Lois' request there will be a graveside service at Bayview Cemetery, Wiarton on Friday August 30, 2013 at 11 o'clock. Cremation has taken place. Donations to Bruce Peninsula Sportsman Club, RCL Br 208 Wiarton, or a local Humane Society would be appreciated and can be made through the Thomas C. Whitcroft Funeral Home & Chapel, Sauble Beach (519) 422-0041.